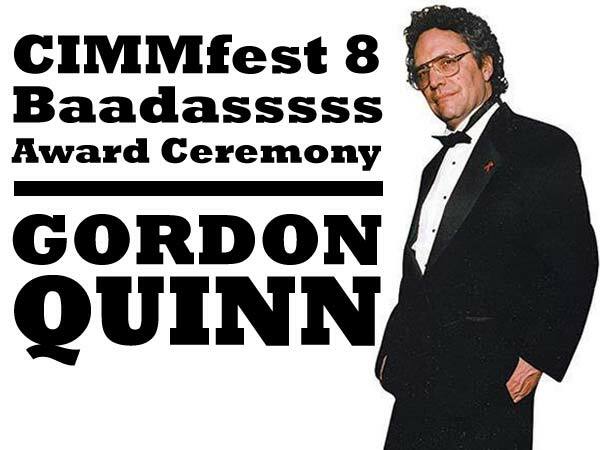 Kartemquin founder and Artistic Director Gordon Quinn will receive CIMMfest’s 2016 BAADASSSSS Award, which honors distinguished careers and lifetime achievement in movies and music, on Friday, April 15 6pm at 1st Ward, Chicago. Gordon Quinn will be in conversation with his friend and occasional collaborator Bob Hercules, of Media Process Group. The event is free to attend (get details). CIMMFest will honor Gordon with screenings of four films, spanning early works he was employed on while still an emerging filmmaker before the formation of Kartemquin in 1966 - the classic music documentaries And This is Free (1965) and Festival (1967) - through to 2010's Prisoner of Her Past, about jazz critic Howard Reich's attempt to uncover his mother's repressed childhood Holocaust trauma, and 2011's A Good Man, about the director/choreographer Bill T. Jones' creation of a dance/theatre performance for Ravinia Festival. We are delighted for Gordon to receive this honor in our 50th year. Previous BAADASSSSS Award winners are SXSW founder Louis Black, director and music video pioneer Julien Temple, and filmmaker and original BAADASSSSS Melvin Van Peebles, for whom the award was named. The eighth annual Chicago International Movies & Music Festival (CIMMfest), a five-day showcase that celebrates the inseparable connection between music and movies, will take place April 13-17, 2016. The festival will showcase 100+ films, live bands and DJs. Festival passes (starting at $79) are available now at www.cimmfest.org, where you can read their announcement of the first films and artists confirmed for 2016. Read more in the Chicago Sun-Times. Gordon Quinn 2016 BAADASSSSS Award Ceremony - Friday, April 15 6pm at 1st Ward.